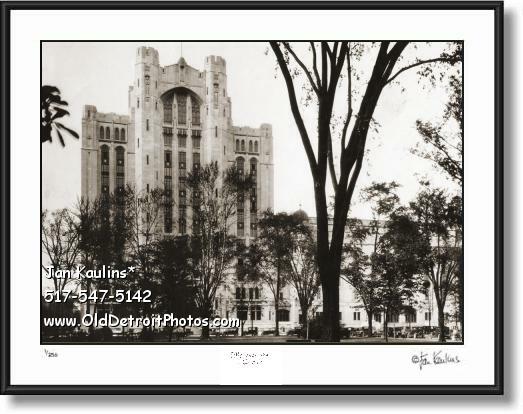 OLD DETROIT MASONIC TEMPLE 1928 photo print picture photography for sale. This sepia toned historic VINTAGE DETROIT MASONIC TEMPLE photo picture print for sale is made from the Original rare professionally restored Original 1928 photo/negative of this incredible architectural structure in Detroit. Work on this marvelous structure began in 1922. On Thanksgiving day of 1926 the final ceremony of this program took place when thousands gathered for the formal dedication of the Temple and the consecration of its rooms, by the Grand Lodge of Michigan, to the work of the Craft. And as a means of opening the public portion of the building as a civic center and for the use of the community at large, a most elaborate and delightful program was offered in the Temple's beautiful auditorium. This is a fabulous image from the very early years of the architectural masterpiece. We can see rows of 1920's vintage cars parked in front of this magnificent structure. The Detroit Temple is unique among the Masonic buildings of the country because all of the various bodies are housed in the same structure. There are some twelve million cubic feet of space in all, making it the largest and most complete building of its kind in the world. THESE BLACK AND WHITE DETROIT PHOTO ART PRINTS ARE VERY HIGH QUALITY REPRODUCTIONS OF ORIGINAL OLD VINTAGE HISTORICAL DETROIT PHOTOGRAPHIC PRINTS OR NEGATIVES. THESE SEPIA TONED DETROIT BLACK AND WHITE PHOTOS ARE OFFERED FOR SALE HERE FOR THE VERY FIRST TIME. THEY HAVE BEEN MADE FROM ORIGINAL NEGATIVES OR ORIGINAL FIRST GENERATION PRINTS, MANY OF THEM ARE 50 YEARS OLD AND SOME DATE TO THE EARLY 1920's AND 1930's. THE RARE OLD DETROIT ORIGINAL PHOTOS AND BLACK AND WHITE NEGATIVES USED FOR THESE PRINTS HAVE BEEN OBTAINED FROM HISTORICAL SOCIETIES, NATIONAL ARCHIVES, THE LIBRARY OF CONGRESS AND NUMEROUS PRIVATE COLLECTIONS. IT HAS TAKEN SEVERAL YEARS TO PUT THESE OFFERINGS TOGETHER ON THIS WEBSITE. MANY OF THESE PHOTOS ORIGINALLY CAME FROM OLD DEFUNCT NEWSPAPER AND MAGAZINE ARCHIVES, WHERE THEY WERE USED ONCE FOR A STORY AND THEN USUALLY JUST THIS ONE ORIGINAL PRINT WAS MADE AND KEPT FOR THEIR ARCHIVES. HENCE, THESE HISTORICAL IMAGES WERE NOT ORIGINALLY MADE TO BE FOR SALE, BUT WERE TO BE USED AS IMAGES FOR NEWS STORIES AS THEY UNFOLDED--MAKING THESE IMAGES EXTREMELY RARE HAVING SURVIVED SO MANY YEARS. VERY FEW OF THESE IMAGES HAVE EVER BEEN OFFERED FOR SALE TO THE PUBLIC UNTIL NOW.